What accounts for the varied approaches individuals use in business, careers, and their own aspirations? In Part One of this piece, I described what one psychologist teaches us about individuals and their motivation to meet their various needs--and how this helps explain behavior and solve problems. We saw how a worker, for instance, can look to advance his or her personal development only once economic stability is achieved. But what I find most satisfying about Maslow's paradigm is how it complements entrepreneurship education and the keys to succeeding in business. 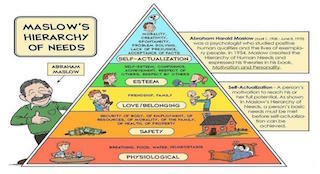 Maslow's hierarchy of needs places self-actualization at its apex--but what does self-actualization actually mean? It's a truly subjective concept that varies from individual to individual. But people that want to self-actualize as independent actors in the economy can look to entrepreneurial education as a key method. Rather than now discuss why entrepreneurial education is key--because I've written about it at length here--I would like to introduce some important concepts in the path to self-actualization as an entrepreneur. John Wooden was a widely known and admired basketball coach. His accolades include six namings as head coach of the year, ten NCAA titles with UCLA, and a spot as both a player and a coach in the National Basketball Hall of Fame. But Wooden was a humble man, and attributed much of his success to a simple paradigm of leadership skills that led to achievements. 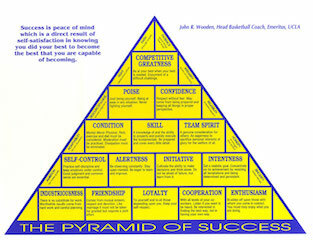 Based on the lessons learned throughout his life and from his father, John created a chart of qualities that he eventually called the "Pyramid of Success." The pyramid and its values are one of the things some of John's most famous apostles--Kareem Abdul Jabbar is one--have talked about in interviews and have even led to notable comparisons with entrepreneurship. John was a big believer in succeeding by focusing on important qualities, rather than simply focusing on winning--to paraphrase, being the best is doing your best, said Wooden. I wrote recently about the concept of failure something that is so key to entrepreneurial success--like Wooden's claim, we must accept failure as part of our journey to success. In fact, he stumbled upon this nugget of wisdom while teaching a college English class where many of his students were solely focused on getting their As. Once you have met the challenges of the first level, it is important to maintain your self-control--this is the moment when your business might be taking off but without maintaining your initial level of effort (or more) and staying alert to your market and consumer, you are not likely to remain on top. Your initiative and sticktoitiveness will save you when you confront the many challenges of trying to enter a market--and in many cases, when you experience failure, these qualities will hoist you back on your feet. These qualities are easy to see embodied in sports greatness, but how do they relate to starting a business? First of all, you need to know your business, your marketing and business skills, your customer, and your product. If you don't know these things, you will never convince anyone to invest in your idea, or that your product or service is different from or better than the rest. As for team spirit, this is integral to running a business and being an employer: as a leader, you should always be ready to care for your company and put their needs above yours. It is through this selflessness that you will inspire the best work and loyalty to your enterprise. As we move closer to the top of Wooden's pyramid, these two qualities become essential to great leadership and running any kind of business. With poise, you can learn to meet challenges head-on, and let them roll off your shoulders. Without that tenacity, it is easy to get bogged down with the problems that face every organization. And without self-confidence in both your leadership acumen and your business idea, you cannot maintain your poise. By following the pyramid and its virtues to this point, you can be confident in yourself and your integrity. At the apex of the Pyramid of Success is competitive greatness--the quality of maintaining all of the aspects of the chart. As an entrepreneur, your job is to stay aware of your market and your customer, but you must also remain flexible enough to continue to compete in your business and adapt to constant change. Check out John's incredible book here. You can read the first part of this piece here.